My husband bought this for me as a gift for our first Christmas together. 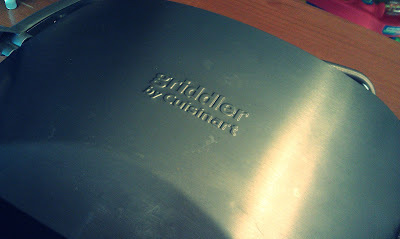 It can griddle or it can grill. It is even a panini press! (But I have only used it for that purpose once. Why is that??) Just flip the hot plates over. 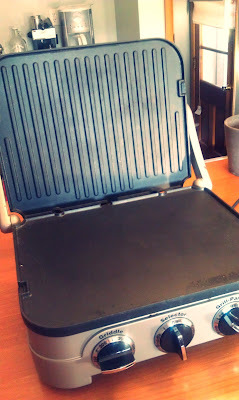 It also folds out flat so you can use both hot plates at the same time if you need to feed a crowd. I cannot tell you how many times I have used this thing in the past year and a half that I have had it. It has grilled steaks, burgers, and chicken. It has had countless chocolate chip pancakes flipped on it. To see my other posts in this Summer Blog Challenge, click here. Oh, now that thing is too cool! How much space does it take up? I have a tiny apartment, but I might look into one of those. Shai, this does not take up much space at all! It was a lifesaver when I my husband & I lived in our tiny 1 bedroom apartment last year. We had the smallest kitchen EVER & I used this often there. It will easily fit on top of the fridge or on a shelf in one of your cabinets.